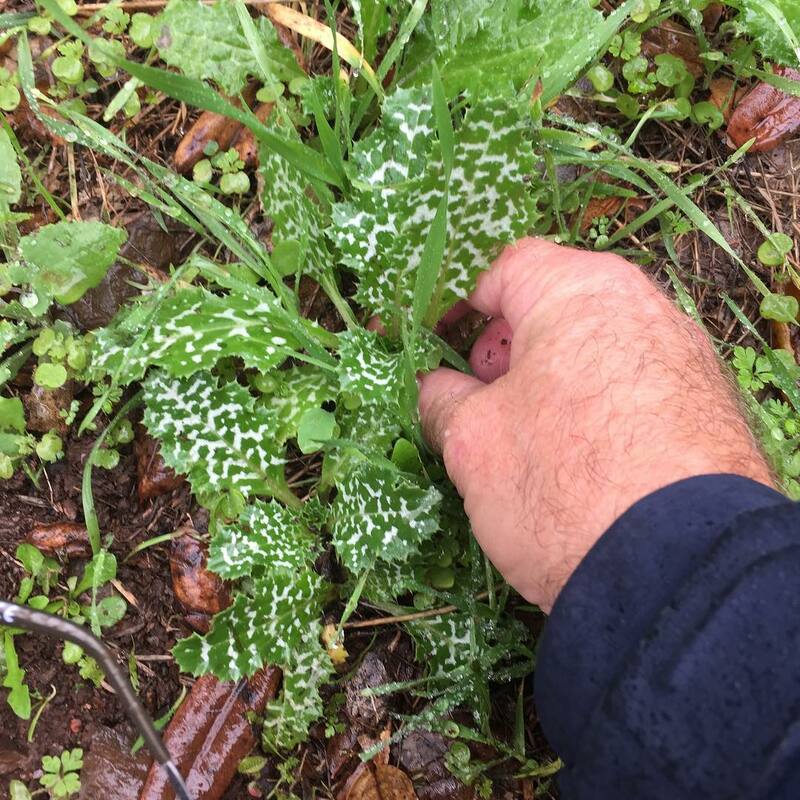 Lately I’ve noticed that Italian Thistle has been coming up, since recent rains have kept the soil moist and we haven’t had freezing temperatures at night. In the past, I haven’t started pulling it until February or March, but I see no reason to wait. When the soil is moist it’s easiest to get it out by the root, and since there is no danger of it going to seed it can be simply tossed aside. Later, we will need to bag it and carry it out, which is no fun. Although we’ve been making very good progress with Yellow Star Thistle (YST) after half-a-dozen seasons of concentrated effort, and we may actually be close to declaring victory (fingers crossed! 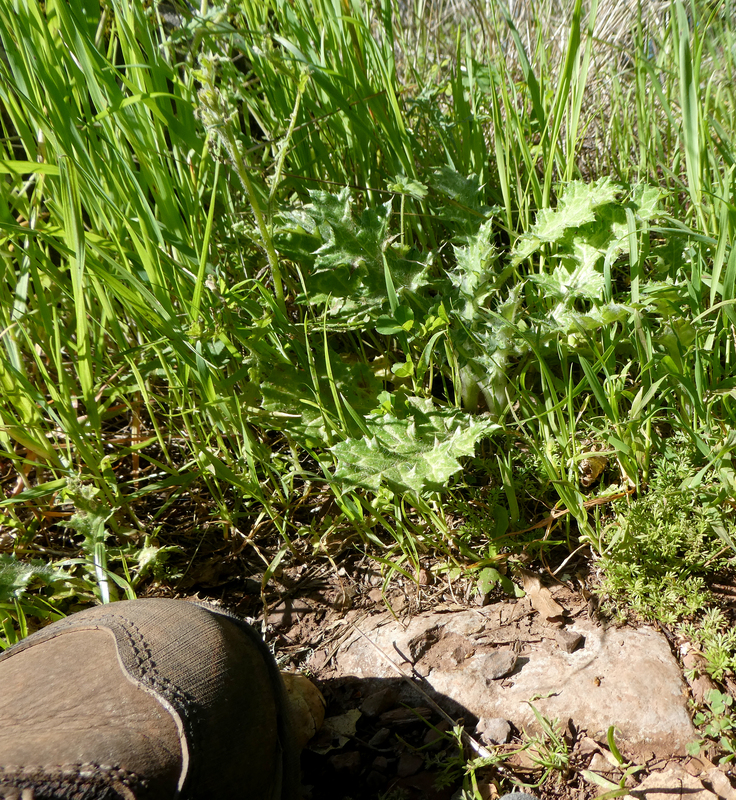 ), Italian Thistle has, in a number of cases, apparently been moving into the new territory cleared of the YST. This is alarming, as Italian Thistle is even more dangerous than YST, as it will grow anywhere. At least YST is limited to sunlit meadows. Italian Thistle has essentially overrun the Montini Preserve, so my only goal there this year is to keep it off the trails so it doesn’t bother hikers. On the Overlook Trail property, I will start the same way by first concentrating on the trail edges, but then I also hope to be able to work on the Upper Meadow, as there are clumps there that threaten to spread and coalesce across the entire meadow unless it’s controlled. So if you’re out on the trail and see what appears to be a gardener pulling weeds, it’s just me, keeping up the ongoing war against invasive species. Maybe say Hi. You could say that I’m a treehouse nut, as I’ve never understood why most people think that treehouses are for kids. The fourth one I’ve built, is in my backyard — a three story monstrosity that tops out at 32 feet above the ground. In the “crows nest” at the top, you can see over our house and down across Sonoma Valley to Sonoma Mountain, and south down the valley toward Marin. The lower parts of the treehouse were built 13 years ago and the upper parts 10 years ago. Both are slowly being absorbed and warped in odd ways by the tree. 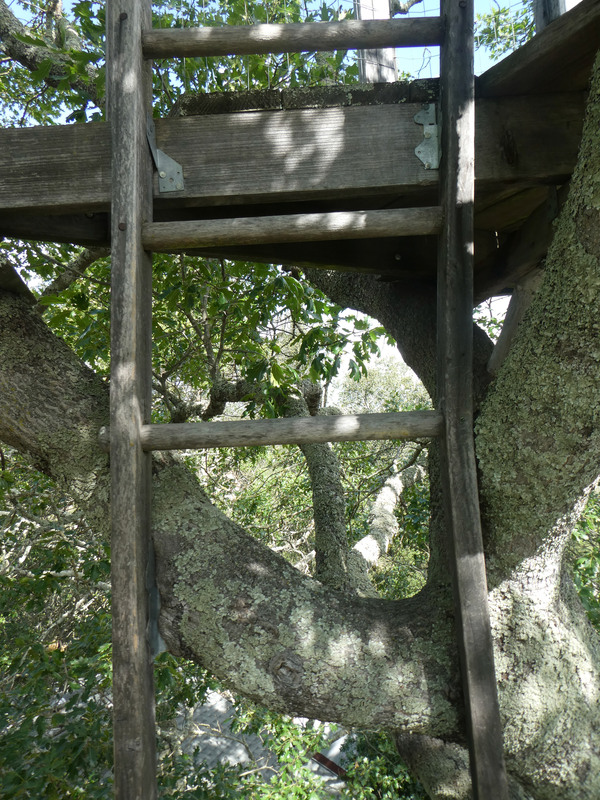 In one spot (pictured), the ladder leading to the crows nest has been slowly bent way out of its straight up and down position. Clearly if it had been warped that badly all at once, it would have shattered. But rather, the tree gently but persistently pushed against it, and it has slowly but surely stretched it into its present position. It is this aspect of “being gently powerful” that one sees a lot in nature. Trees can also break stone using the same technique of very slow but persistent pressure. In a related example, on a river trip through the Grand Canyon you eventually come to a section deep in the canyon where the oldest rock is exposed. It is a very hard, metamorphosed volcanic granite and schist. And yet the Colorado River has not only carved it’s path through the very heart of it, it has actually sculpted it, with intricate and fascinating incisions (see photograph). 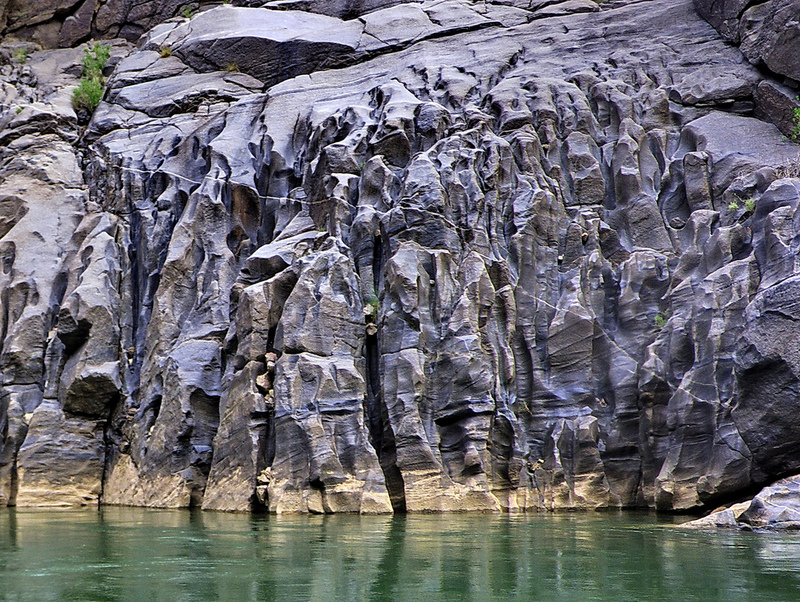 These were formed not by one cataclysmic event, but by the very slow and constant caressing of suspended silt and sand by the river over eons. The river is being gently powerful over a very long period of time. I’ve come to believe that is exactly what our efforts to clear the Overlook and Montini Preserve of invasive species needs to be like. We need to be gently powerful for many years. As I said to someone on the trail recently, “this is a program, not a project.” You could also call it a war, not a battle. But that’s a more violent image that I prefer to avoid. I prefer the idea of being gently powerful, as that is more like what it feels like. Each day that I can get out on the trail during thistle pulling season I am blessed to experience the outdoors, feel the sunshine, sweat like crazy, and do something that I feel is meaningful. That feels like being gently powerful. And something that feels worthy in and of itself. So the next time you see one of us out there pulling invasive species, think of us as a tree or a river — gently, but powerfully and persistently, pressing against what we oppose. It, too, will give over time, as all things that are gently, powerfully, and persistently opposed eventually do. Vishnu schist photo by Al_HikesAZ, Creative Commons License CC BY-NC 2.0. Tripping down the trail today I thought to myself, “Oh, hey, there’s one!” I had spotted an invasive purple thistle plant at the trail’s edge (see pic). I stooped to pull it out. 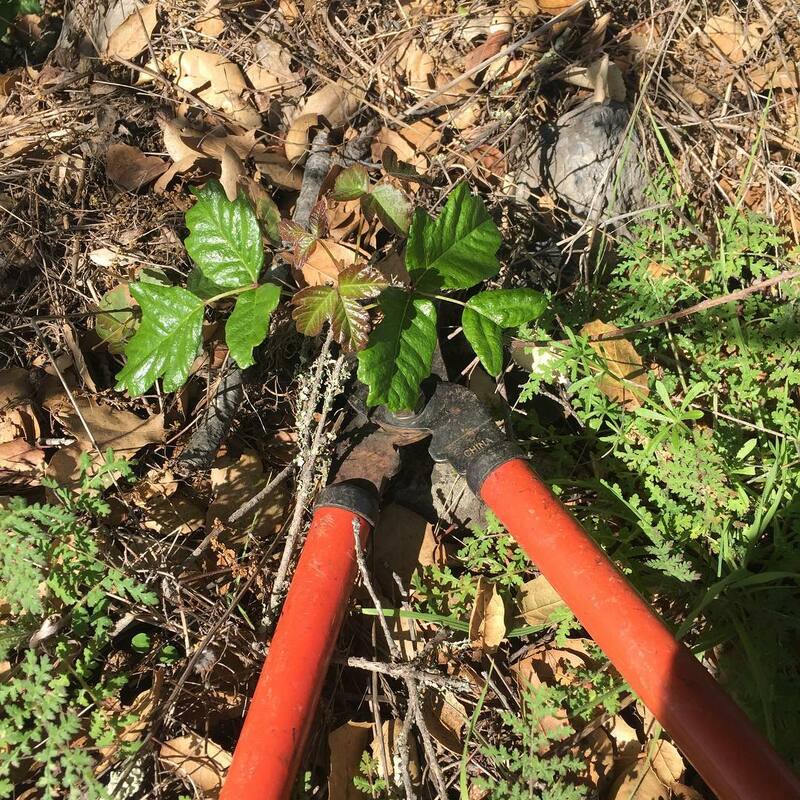 As volunteer trail stewards, our remit includes not only maintaining the trails, but also helping the City of Sonoma to maintain their property that the trails traverse. This includes removing invasive species such as broom, purple thistle, and yellow star thistle. Purple thistle season begins in early Spring, which means we are already working to remove it. Later in the season the yellow star thistle will start to come in. Since we’ve been attacking the yellow star thistle for several years with vigor, we are seeing some real progress on eradicating it from the Overlook and Montini Preserve properties. However, purple thistle is quite another story. Mostly due to years of cattle grazing, purple thistle has essentially already overrun the Montini Preserve. So at this point we only focus on yellow star thistle there. But on the Overlook, we think we have a chance to knock back the purple thistle so we are working on it as well. Since we only began our work on it last year, there is still quite a bit of it on the trail. I had momentarily forgotten that until the day when we reach the point of eradication — years, perhaps even decades from now (if ever), there’s never just one.